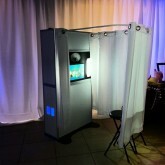 Our Photo Booth Rentals are lots of fun and will entertain your guests throughout your event! In addition, your guests will leave with cool funny pictures of themselves and their family and friends to cherish and remember your special event! Great for Weddings, Corporate Events, and Bar/Bat Mitzvahs. Photo Booth There is 1 product. Photo Booth Rentals in Miami are perfect for creating memories at Weddings, Birthday Parties, Bar/Bat Mitzvahs, and Corporate Events.